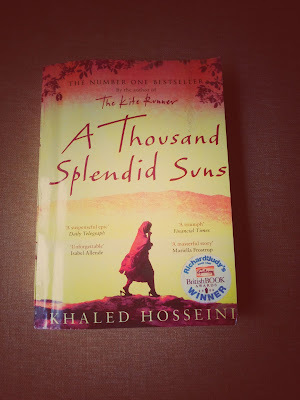 After I finished reading Khaled Hosseini's 'A Thousand Splendid Suns', I was firm on not writing a review on it. The sole reason was because I thought I am just a nobody to review such a classic masterpiece of a life-changing novel. However, somewhere within the heavy pages and the deep after-thought, I decided to write one. So, here goes my review on a book that I loved throughout. My apologies for any mistakes. I hope all of you read this book. 'A Thousand Splendid Suns' is the life story of two women living in Afghanistan wherein there is sustenance of war. The story is so gripping that it becomes impossible to put the book down. In the recent utopian, dystopian and coming-of-age novels, this work of art stands different holding its earned importance. I loved Khaled Hosseini's writing style. He brings out every emotion within the reader. He never leaves the reader in a state of confusion even after not putting up the facts namely. He is an incredible and a worthy writer. Mariam, Laila, Rasheed and Tariq are the main characters. Mariam is a woman who was brought up with all the traditions and customs. Even without education, she comes off as a girl with thought and a woman with insight. Even after going through all the hardships humanly possible, she still fights through her life for the love of her dear ones. She is courageous, smart, caring and always hopeful. Laila, at first, strikes as totally opposite to Mariam. She is educated and brought up with modern and lateral thinking. Unfortunate events change her life completely as she turns into a wife restricting herself from education and other privileges. She is a fighter and a believer of justice. She is compassionate, loyal, smart and brave. Rasheed is made out perfectly for the readers to hate. He believes in all the old traditions, ill treats his wives and subjects them to a lot of restrictions. This antagonist displays an example in the society. Tariq is a lovable character like a knight in shining armor. His love is evident as are his actions and words. He is the person who is like sunshine in this story. Aziza and Zalmai are sweet kids. I loved Aziza more, which is obvious. The story is divided in four parts. Part one witnesses Mariam's life from being a little girl to being in an unhappy marriage. Mariam lives with her mother and meets her father once a week. As the story progresses, her mother commits suicide. That leaves her with no option but to get married to a strange man and move to a strange place. Her husband Rasheed seems kind for only 10 pages. He becomes intolerable and abusive after the loss of their unborn children. Part two is the most fun the story could get. In this part, there's a wonderful heart warming love story between Laila and Tariq. The story is sweet and lovely until reality happens. Tariq leaves town. Subsequently, Laila's house is destroyed making her an orphan. Part three is where the two stories connect becoming the most commanding and powerful journey for Mariam, Laila and Rasheed. He marries Laila which brings out initial conflict between the two wives. But gradually, there forms a bond between Mariam and Laila by which they their lives become better. They start to live just for the sake of the other. This almost mother-daughter bond among all the other cruelties gives hope. The end was quite astonishingly satisfying. The murder of Rasheed by Mariam to save Laila was heroic. I really wished that all of them (Mariam, Laila, Tariq, Aziza and Zalmai) could live together after Rasheed's death. But only after Mariam's confession, her death sentence and the safe lives of the others, it occurred to me that it was the right decision. The author made me switch sides within a few pages. That's the power of writing, I believe. Part four is the concluding chapter. In this, Laila gets the required closure on Mariam. The author's brilliance shows clearly in this. Most people might find the last part irrelevant but actually it is vital. The readers get the closure on Mariam. They weep when they read Jalil's letter. They wonder what would have happened if... They are mesmerized, sad and also needy. That's why I absolutely loved to read this book from an author I hadn't read before. It had suspense and an edge. 'A Thousand Splendid Suns' focuses on the values of family and love. It also portrays the life in a country with constant turbulence. Among war and traditions, there also exists an unforgettable love story. This novel clearly has it all. There is love and hate, life and death, poverty and prosperity. The story never gets boring for even a second. It taught me a lot about how to keep the readers engrossed. It's impossible to lose interest in it. It is a story that speaks beyond words and reaches across lives. Such books are the ones written once in a decade. It is a target-setting, thought-provoking and a must read novel. I love this author, but still haven't read this book!